Why Slam, the poetry competition hosted by local music venue Why Sound, celebrated its first Halloween with a special event called Spookfest on Tuesday evening. Poets were encouraged to perform their spookiest poems. Performances were rated by a panel of judges who gave scores on a 10-point scale, with an added bonus of up to five “ghost points” given for especially scary pieces. The winning poets were Kate Lange in first place, Justin Peterson in second, and Elijah West in third. 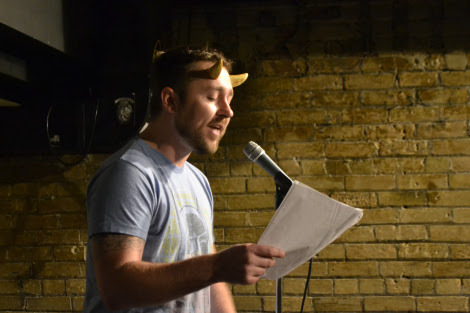 Justin Peterson, sporting horns for Spookfest, performs an original poem. Nate Hardy, a Utah State student who performed at Spookfest, credits both host Kate Lange and the crowd at Why Slam for creating a great atmosphere. For Hardy, poetry is a way to break the monotony of everyday life. Hardy is grateful for the opportunity to share something he is passionate about with others. The floor of the downtown Logan venue served as seating for the crowd who gathered to watch the performers. Justin Peterson, a poet who often performs at Why Slam under the name Weird Sense — “like weird sense of humor,” he explained — has been happy to see the growth of the event and its community in recent months. For Peterson, the highlight of tonight’s event was seeing the new poets who performed.